After my retirement in 2005 at the age of 65 years and with persuasion from friends and relatives, I decided to give back to society. 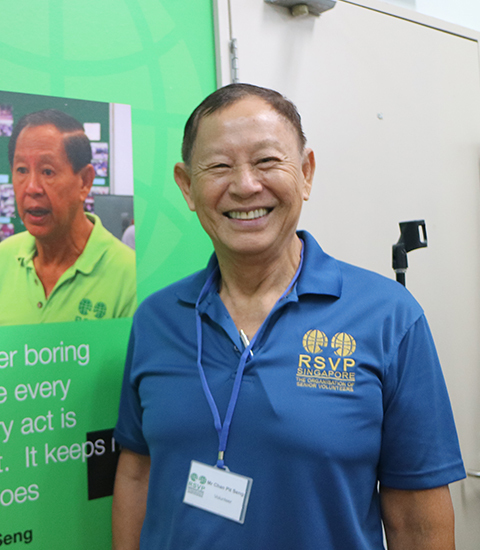 I got to learn and know of RSVP as an organisation of senior volunteers which is geographically close to where I live. I possess the necessary professional skills and knowledge which I want to share with others. Since I have decided to ‘donate’ my skills, I slowly got to know the people in the community. Initially, I started as a mentor looking after at-risk children at First Toa Payoh Primary School. I remained there for almost three years before I switched fully to teaching conversational English. Now I spend about 4 hours of teaching per week at RSVP. Besides this, I am also involved in other activities on an adhoc basis e.g. organising New Year parties, performing as master of ceremony for RSVP’s functions, conducting volunteerism and heath related talks. I also started the Karaoke sessions for volunteers who love to sing. Periodically, the Karaoke Group is activated to bring joy and cheer to elderly residents at nursing home. Now that I have more time on my hands, I want to do something different from my old job. I want to stand up and be counted as I believe I still have values and self-worth. I know too that I am needed and I feel good that I can repay my debt to society by demonstrating my contribution to a good and useful cause. If I can make an impact on others, why don’t I do it? I may make a difference to someone’s life. My voluntary work is challenging, fulfilling and meaningful. Being a good team player, I soon make a lot of new friends and my network of friends is expanded. Besides feeling good, I receive some benefits in the form of recognition and favours but not for pay. I also get a chance to learn something new to further improve my interpersonal skills and human quality of life. I am able to hone my public speaking skills by being a member of the Gavel Club where I managed to earn myself the title of a competent communicator. Voluntary work is a two-edged sword which cuts both way – the giver as well as the receiver. If you have got the passion, join us as a volunteer and we will provide you with good opportunities to share your skills and experience with the community. You will benefit too by leading a fulfilling and meaningful life.